The refined blend of styles and materials take you on a wonderful journey. 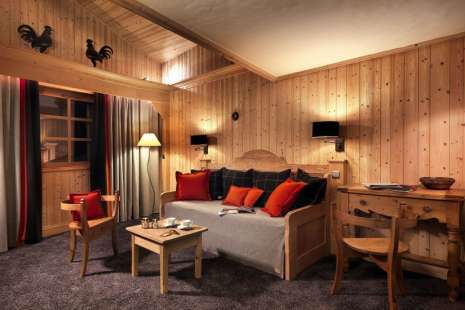 A pleasant, authentic and comfortable room to enjoy the present moment. Modern, well-being and comfort define this room with its contemporary decoration and furniture and its technical equipment for the pleasure of an unforgettable stay. Ideal for a couple who want space or a family of 4 people, the 30m² on one level is divided into a bed room and a living room for privacy and relaxation. The spacious and comfortable suites offer a privileged space upstairs with a private bedroom a bathroom , a bedroom / living room downstairs with a shower bathroom. A Suite with distinct living areas which offer a generous and comfortable space on two levels with contemporary furniture and charming decoration together with technical equipment offering tranquility and well-being. 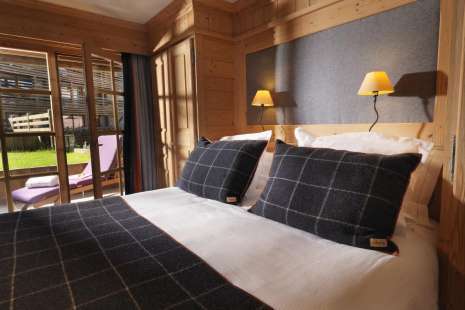 The M de Megève offers the ultimate in luxury in its Royal Suite. A Balneo bathtub, elegant and refined design, a high level of equipment including an open fire... taking you on a relaxing journey.